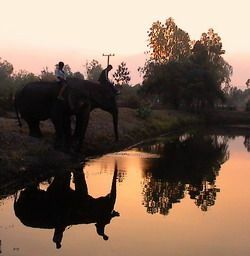 The Thai people have a long, shared history with the elephant and today the elephant remains a potent national symbol. 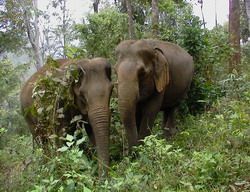 In the past, Thailand’s forests teemed with a vast wild population estimated at the beginning of the 20th century to be in excess of 300,000 with a further 100,000 domesticated elephants. Those numbers have plummeted today and there is deep concern for the survival of Thai elephants. 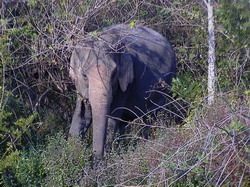 While this information source is considered the very best available, accurate data on wild elephant populations is difficult to obtain and scientifically verify. Many Thai experts believe the number of wild elephants to be very much lower than the figures quoted above and some put the total number at below 1,000. The dramatic drop in the numbers of wild elephants in Thailand over the past hundred years has been accompanied by a big increase in the human population and major habitat loss as the forests have been cleared for agriculture. The pressure caused by habitat destruction has been exacerbated by the poaching of bulls for their ivory and young calves to be trained for tourist shows. The big fear of elephant conservationists is that the remaining pockets of wild elephants are scattered throughout the country on green islands, hopelessly fragmented in small genetically unviable and unsustainable herds. The biggest wild populations are found in Khao Yai National Park, the Thung Yai and Huai Kha Wildlife Sanctuaries and along the Burma border. Wild elephants are protected in Thailand by national laws and the CITES Treaty. Concern for the Thai elephant led to the establishment of the National Elephant Institute (NEI) which grew out of the Thai Elephant Conservation Centre in Lampang. The NEI works closely with the National Parks Department and NGO’s to help protect the remaining elephants and elephant habitat. There is hope that Thailand’s large domesticated population can be utilised to maintain the genetic diversity and help the continuation of wild elephants in Thailand. Thailand has a long history of the domestication and use of elephants. It is said that one of the first ever depictions of the Thai people occurs on a frieze at Angkor Wat showing a Thai military unit complete with war elephants. Historically, elephants were used for transportation and war and reigning monarchs maintained a large elephant corps. In more recent history, elephants were employed in the timber industry in the same way that they continue to be used in Burma. This employment allowed the maintenance of significant numbers of elephants. However, that changed in 1989 when the Thai government banned the logging industry. Thousands of elephants were abruptly thrown out of work. Some of these animals and their mahouts escaped over the border to continue plying their trade in Burma but many others were thrown into crisis. Often elephants were only leased by the logging companies and actually owned by comparatively poor villages or mahouts. Overnight, the elephant went from being the main bread winner in the family to an unaffordable outgoing; the cost of food and care being beyond the owners’ means. Some of the elephants found gainful employment in the tourist industry but many others are forced to seek out whatever existence they can. The circumstances described above have led many mahouts to take their elephants onto the streets of Bangkok and other major cities to be for money. Street elephants suffer terribly and the sight of these animals has caused great distress to both urban Thais and foreign visitors. Despite numerous campaigns and promises of government action, the authorities have never been able to keep the elephants off the streets for long. Until other employment can be found, it seems that the spectre of street elephant sin Thailand is likely to remain. The long term survival of the wild elephant population in Thailand is under the severest threat. The greatest hope is that the government, the National Elephant Institute and other interested parties are able to make a success of the National Parks Policy and enough protected habitat can be laid aside in which viable elephant populations can survive. Thailand’s highly successful tourist industry is likely to ensure that large numbers of domesticated elephants will remain in employment for the foreseeable future. The biggest concern are for the welfare of these and Thailand’s other domesticated elephants. The government is currently considering legislation in this field and hopefully an enlightened policy will provide elephants with the legal protection they need.